Welcome to your connection with Far North Queensland local history! Come in, and find out more! This is an historical website in partnership with other historians, associations and public libraries so they can post and sell their Far North Queensland research on-line. Using the 400 pages of the 1889 Royal Commission into the Sugar and Tropical Produce industries (microfilm John Oxley Library) as the basis document, a searchable website has been produced that continuously expands with the contributions of our subscribers and aligned public libraries. 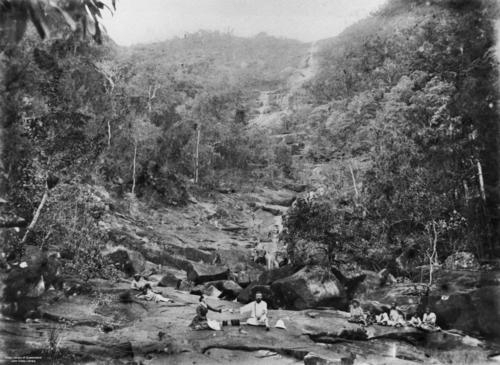 The 1889 Royal Commission investigation embraced all the sugar producing areas from Port Douglas to Bundaberg and interviewed 154 witnesses from mill owners, workers, hospital attendants, kanaka employers &c – all the earliest pioneers - and provides a perfect time capsule of all these long-gone activities in those tiny, tiny settlements, some only a few years old. and supplied a list of all copyright-free local history books that can be lawfully scanned so searches can be conducted on-line on the website by visitors. Members of the public and private historians subscribe to the website and provide their own contributions, which are indexed and included in the site’s General Index. A search fee applies to other members wishing to examine private entries, chapters, papers or even books of other contributors. They are literally selling their work on-line. Each subscriber also lists their relevant interests and a chat-forum has been established so members can converse with each other on-line. Members are always encouraged to include as much John Oxley Library material as they can and quarterly research projects are undertaken at the Library to extend the breadth of the project. Please feel free to subscribe or even recommend this site to others. Every home, be it ever so humble, has a story to tell. So, too, does every block of land, including the one your house is built on. Your house is simply the current product of a very long historical process. Need to know where you live, contact. Queenslandplaces.com.au. is an exciting new public website with over 1,100 illustrated entries on all the cities, towns, suburbs and villages in Queensland that now have or once had populations of 500 or more. Queenslandplaces.com.au, developed by The University of Queensland with the support of the Queensland Government, is a great new educational resource for teachers, students, family historians, and visitors to Queensland. The site contains more than 5000 historic photographs, postcards, colour slides and other illustrations.